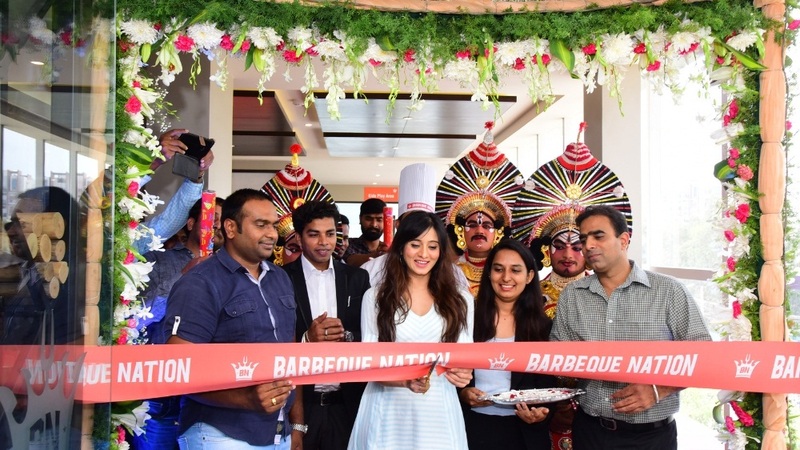 Bengaluru: Barbeque Nation, India’s leading casual dining restaurant chain, announced the launch of its 12th outlet in Bengaluru and 126th in the country. The new outlet is spread over an area of 8750 square feet and is located near Wipro Gate, on Sarjapur road. Sandalwood’s Harshika Poonacha inaugurated the brand new outlet and in her address to the gathering, spoke of her love for food and Barbeque Nation in particular. The new outlet will be open between 1 PM and 3 PM for lunch and between 7 PM and 11 PM for dinner. A meal for two will cost around Rs 1600. Barbeque Nation opened its first outlet in the city in 2007 and has, since then, come a long way in redefining the concept of casual dining, giving diners a chance to barbeque their own food on the table with unlimited starters. The latest outlet can seat and serve over 214 guests at a time. The restaurant has been carefully designed keeping in mind the heritage and the philosophy of the Barbeque Nation brand while offering new experiences like barbeque pit, larger dessert stations, an egg station and over 100 dishes. Foodies in and around the region now stand a greater chance to experience the delight of grilling their own vegetarian and non–vegetarian barbeques on live grills, embedded on the tables at the restaurant. The restaurant offers a pre-fixed menu with a fixed price. The menu is drawn from the Mediterranean, American, Oriental, Asian and Indian cuisines. Customers can grill starters in a range of marinades and sauces and enjoy them right off the skewers, at their own tables. Apart from offering a delectable menu, the ambience at the restaurant follows a theme that radiates a contemporary, vibrant and sizzling skewers on tables that double as a live kitchen. The eat-all-you-can buffet at Barbeque Nation showcases an array of vegetarian and non-vegetarian spread. As for starters, the non-vegetarians can indulge in the famous Mutton Kadhak Seekh, Chilli Garlic Prawns, Ajwaini Fish Tikka, Murg Boti Kebab and much more, while vegetarians can feast into the mouth-watering Hariyali Kumbh, Pineapple Chaat, Cajun Spice Baby Potato and Punjabi Paneer Tikka, among others. The dessert section comprises of Walnut Brownie, Assorted Pastry to Angoori Gulab Jamun, Marvel Cake, and Kesari Phirnee. The wide range of Kulfis at the restaurant’s most famous Kulfi Nation counter will leave the guests salivating, where they can twist the kulfi by mixing various flavours into one and create diverse combinations. ವೈರಲ್ ಆಗುತ್ತಿದೆ ಬಹಭಾಷಾ ಟಾಪ್ ನಟಿಯ ಹಾಟ್ ಫೋಟೋಗಳು.